The HMX is challenging conventional wisdom that Hurcos are only for small job shops. 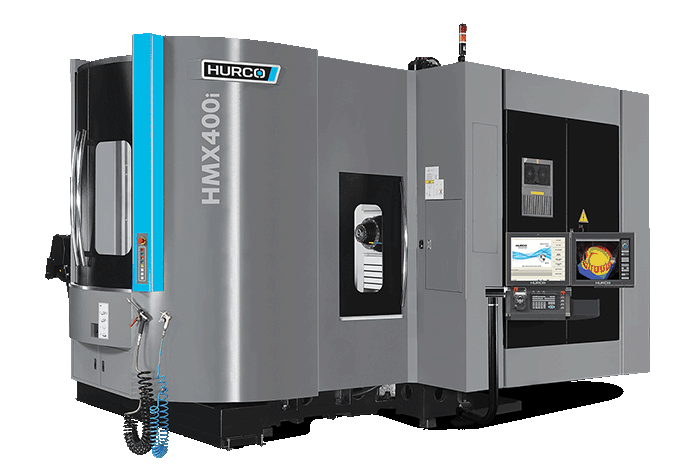 Hurco horizontal machining centers routinely match the performance of machines costing twice as much. Easy entry into horizontal machining for efficient and fast chip management. Probing, CTS up to 1,000 psi, spindle chiller, scales, and more. The Hurco HMX horizontal machining center is optimum for low to medium-batch production runs. The design promotes better chip control—gravity does the work with chips falling effortlessly. The unique traveling column provides the speed and precision required for advanced machining processes and it’s capable of much higher contour machining rates and superior surface finishes compared to a typical vertical machining center with a similar design concept. The box-in-box design leads to increased rigidity as do the pre-tensioned, dual ballscrews. 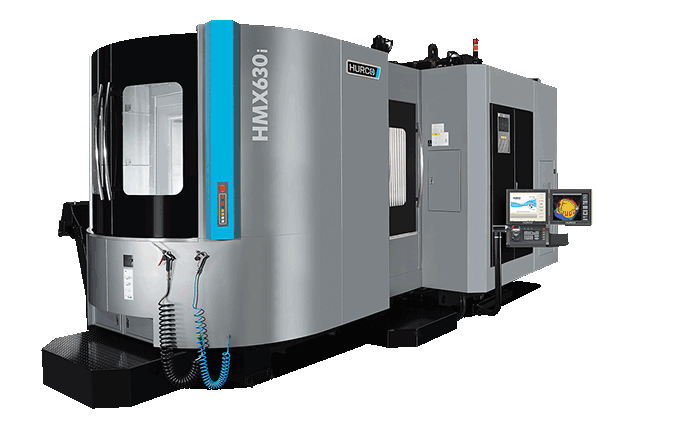 The HMX has a fast, twin 630 mm pallet system that keeps cycle times short, and the fully integrated 4-axis capability of the HMX allows complex production parts to be machined efficiently and accurately. For example, if you need to edit a part or correct a feature, you don’t have to search through lines of code—with Data Block Search, you simply use the graphics screen to select the section you need to edit, and the corresponding code appears on the other screen so you can quickly make the change. Concurrent programming is another feature that is enhanced with the dual-screen control. While the machining center is running one part, you can program the next part without interrupting cycle time. The control technology maximizes the performance of your HTX machining center whether you use NC or conversational. With DXF Transfer, you send the dxf file directly the control. Edit the program as needed at the control, and check the part on the screen with our powerful verifications graphics system that includes 3D solid rendering of the part with dynamic rotation and real time tool display. You can view the part from any angle without being forced to redraw it. Equipped with high-speed microprocessors, huge RAM and hard drive, the Hurco control easily links 2D, 3D and multi-sided machining programs with its CAM compatibility.​ The integrated Hurco control is the most important part of our horizontal milling machines because it has the features that make you more productive and more profitable. Additionally, the open architecture of the Hurco control supports easy integration of robots, pallet pools, and other automation options.